“The law itself could not insure that all brewers would have skill, flair and sensitivity, but in no corner of the world has as much good beer been made as in Bavaria. No beer routinely tastes as clean and malty as that made in Bavaria. If the law prevented the Bavarians from making Belgian Kriek or British Sweet Stout, for example, no one seemed to mind. Now, if the Germans want these specialities, they can import them”. Beer fans are aware, many of them, that since the 1500’s Germany has had a form of “pure beer law”, the Reinheitsgebot. The law has a long and complex history which, in the context of a quotidian blog, I will summarize as follows: in 1516 two dukes in Bavaria enacted a law that required for brewing only three things: water, barley and hops. Yeast was not mentioned, probably because beer was often fermented by wild yeast, or if yeast was regularly harvested from ferments and reused, it was taken for granted as necessary to produce alcohol. Also, barley is specified, not barley malt, but one can infer barley malt was meant as this has been the interpretation of the law for hundreds of years. Also, it is extremely difficult in practice to brew from 100% raw (unmalted) barley. Bavaria was smaller then than now, and the law initially did not apply in other German lands in the south, and in the north. In brief, the law was extended to these other parts progressively as Germany unified, becoming a national measure only in 1906. In 1918 after WW I, the reconstituted Germany agreed to accept the pure beer law when Bavaria insisted on it as a condition of entry. Northern Germany had its own beer traditions. Many of its beers used herbs, fruits or other ingredients not allowed by the pure beer law. Eg a beer called Lubeck used, in addition to conventional ingredients, oatmeal, beans and a variety of herbs, possibly attesting to the pre-hop era when, as in Britain and elsewhere, a wide variety of flavourings were used. Some beers used unmalted grains as a fermentables source, as Belgian wheat beer (wit) still does. Once the pure beer law became writ in these areas, these beers disappeared, as did the use of rice in some German lager in the north. Before 1918, the law was referred to as the “surrogates law”, that is, a law banning substitutes in brewing. Only when Germany re-federated in the wake of WW I was the law referred to as the purity law, which is the meaning of the term Reinheitsgebot. It has been stated by some writers that the original law was passed partly or wholly to protect the bread market from competition with brewing, in effect to protect a staple of the people. In general, barley is better suited for brewing than baking. Wheat contains a large amount of gluten and other proteins. Gluten is not generally desirable in brewing but suitable for bread and other baking. Thus, the “allocation” theory has a surface attraction, as does a trade protection theory which has been bruited. These are theories and inferences, not clearly established by period sources as far as I know. One can as easily infer, or I do, that the first pure beer law was a quality measure. Possibly the law had multiple justifications, this does not of itself remove the basis for its continuation in Germany. The law evolved over time to take account of a number of factors, primarily the existence of a wheat beer tradition (reliant partly on malted wheat) which took root in the royal court in the 1600’s. Also, top-fermentation brewing survives as a vestige in German brewing, notably the alt and kolsch beer traditions. Top-fermentation brewing, reflecting its artisan roots, always used a broader range of ingredients than bottom-fermentation (lager) brewing. The modern pure beer law, last changed in 1993, permits for such beers certain sugars and malted grains other than barley malt. In summary though, for lager brewing, only barley malt may be used, no other source of starches, e.g., corn, rice, unmalted barley or rye, and no sugars. Even in top-fermentation brewing, no raw grains can be used, they must be malted. In the early days of North American craft brewing, the pure beer law had a huge influence. Most craft beer was and still is made from all-malt. The Brewers Association, the national group which represents U.S. independent small brewers, until 2014 required that member breweries have an all-malt “flagship” beer. This requirement was changed in that year to permit old-established regional breweries to join the BA which had always used a measure of corn in their main brands. Nonetheless for 35 years until then, the growth of the American craft beer movement was built mostly on all-malt beer, a momentum which carries on to this day and has provided a boost to quality brewing in England and elsewhere around the world. England also required beer to be all-malt until 1845 when sugar was first allowed in brewing. Later in the century, a “free mash tun” law permitted grains other than barley to be used in brewing as well. In 1987, the European Court of Justice decided that the pure beer law, while still valid for Germany, could not be used to prevent import and sale of beer which didn’t meet the law’s requirements. To do so would be to countenance a trade barrier inconsistent with Germany’s free trade obligations under the 1957 Treaty of Rome. Nonetheless, Germany’s beer market, reflecting in part probably cultural and historical factors, is still largely a domestic one, which hews to the law loyally except for some exports. It is my perception that the exports typically encountered in our area comply with the law. I had a Holsten Premium last night which so advertised on the label and had the full clean taste I associate with an all-malt beer. Many argue the German pure beer law is no longer necessary if it ever was, that it restricts unduly the range of beers that German brewers can make, and in any case doesn’t ensure of itself that beer will be well-brewed. I would argue that the law is well-founded because all-malt beer is a gastronomically superior flavour and the long continuation of the law in Germany reflects that understanding, one that may (often) be tacit but is no less real for that. People do not have to know a lot about beer to appreciate its quality – it is only when confronted with a beer reliant on, say, 40% corn adjunct that they see the difference. Corn and rice contribute a high degree of fermentability to beer in contrast to barley malt, therefore primarily contribute alcohol, as does sugar. This is not to say various forms of these adjuncts don’t leave traces of their flavours – they can in some cases – but all-malt beer in my own experience has a richness and full quality no adjunct beer has. True, if you use adjunct in very small amounts, or in very strong beers, the difference may be hard to detect, but adjunct use is a slippery slope as the history of American lager shows. What was 10-20% in the late 1800’s became 30% and today can be 40% or even higher. People say some famous Belgian beers use sugar, as most British beer did even before adjunct lager became the main type consumed in Britain from the 1970’s. British ale however never used adjunct in the same quantity as American mass market beer. This assisted to preserve its character especially as it remained reasonably hopped to the present day. Anyway, what is suitable for Britain and Belgium should not necessarily apply to Germany. It has its own traditions and its beers, while certainly not all of high quality, in general have a roundness and drinkability which unquestionably in my view is linked to their all-malt construction. Even alt and kolsch beers are all-malt, and for good reason. Drink a German bock or dopplebock, most brands, and you may see why, but the quality is evident in all German beer IMO albeit specific formulas and house tastes won’t appeal to everyone. Why did Heineken move to all-malt – returning to its 1800’s roots – 20 years ago? Because it knew this assisted beer quality and improved consumer acceptance. Would even Beck’s, which I like when very fresh, be better with 30% adjunct? I don’t think so. Adjunct beers have a characteristic dryness, a “starchy” quality that detracts IMO from their beer nature. One can argue adjunct doesn’t have to have this effect but I think it does, generally speaking. There is no way craft brewing would have achieved the growth and world acceptance it had without being based on all-malt. American all-malt ales of the 1980’s, which simply restored the kind of beer typically encountered for most of the 1800’s in Britain, had a savour and richness of high gastronomic standard. It made people take notice. A good example is Sierra Nevada Pale Ale, or Anchor Celebration Ale, or (in lager brewing) Sam Adams Boston Lager. But there are countless others which show why such high quality beer immediately made an impression – all-malt was a major part of this. 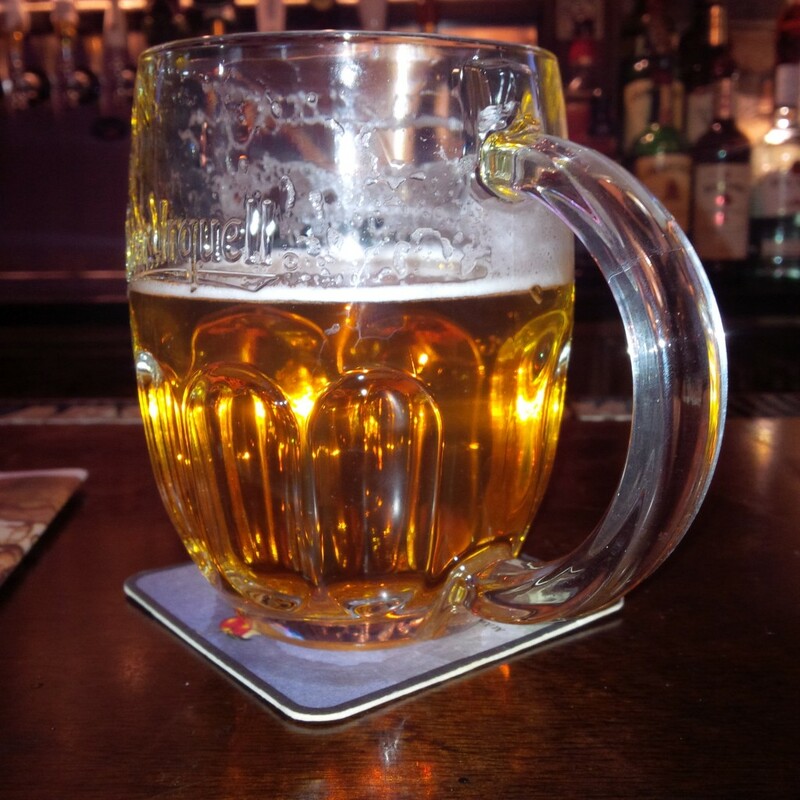 Pilsner Urquell is the classic all-malt pilsner, the biggest selling import in – Germany. If Germans didn’t recognize the superiority of all-malt on palate grounds, why would the Czech Urquell have such an honoured presence in its market? And this is nothing recent, the recognition of Bavarian beer as superior in Germany was attested by an article in the 1850’s in United States Magazine, called “History of Beer”. The author described how the “conquering Bavarian hogsheads” were replacing northern beers deemed suspect by their high strength or use of unconventional ingredients. One can say today this was a naive inference from what the author was told or gleaned on a German tour, but he is clearly reporting common knowledge of the time. This is many decades before the pure beer law was applied nationally. The writer knew that northern beers were “beer”, but was of the opinion the German market was quickly abandoning them, once again well in advance of the beer law extending to all German provinces. The argument that a scheming law (so to speak) pushed out firm local favourites doesn’t hold, er, water. All things equal, all-malt brewing sets a high standard for quality. It doesn’t mean good beer can’t be made from different ingredients, and I am all for such variety, but brewers who want to grow their market can never go wrong IMO by sticking to all-malt as their “flagship”. When beer becomes too reliant on adjunct, people may stop buying it – look at what is happening to mass market North American lager and light beer, it is a declining category. The Germans will be wise not to let that happen. I know that beer consumption had fallen in Germany in recent years (now somewhat recovered), but would the situation be better if brewers were allowed to use corn and rice in their helles and pils? I don’t think so. I am all for introduction domestically of anything brewers want to make. Nuanced labelling can surely address the difference appropriately. Perhaps an amendment to the current law is advisable to permit such products to be called, say, “Non-German Tradition Beer”, or “Historical Tradition Beer”. If that is too close to the mark, the term “Specialty Beer” might work. E.g., “Specialty Beer (Non-German Tradition)”, “Specialty Beer (Historical Category)”. Brewers can work with legislators, I’m sure, to come up with a solution. But that “beer” tout court in Germany should remain malt-based and using barley malt for lagers, I have no doubt. I did read that barley not malt was specified as back in the day malting was considered part of brewing not something separate from it.